Today I got my hands on a beta version of the DSTV Mobile phone. 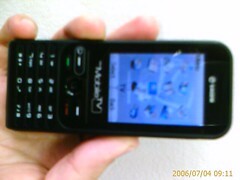 This awesome little piece of hardware manufactured by Sagem called the myMobile TV integrates a full featured GSM phone with TV Capabilities. 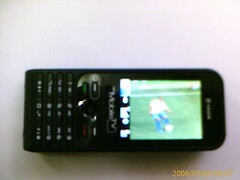 The phone capabilities are pretty good and the menu structure reminds me of the Sony Ericsson interface. The TV functionality is where the real power in this phone lies, and the screen quality is amazing. You can currently watch 12 DSTV channels in full colour/ full sound quality, and I’m sure they plan to open up more channels on release. I watched the dramatic fall of Brazil on this baby and have posted some pics here. This technology is really going to change the way we percieve TV and the distribution model that DSTV chooses for this service is going to be really interesting. The phone that I tested came with a CellC sim card and that may hint as to who they will partner with in order to deliver the service. I dont think they will be exclusive when choosing a mobile service provider and may partner with all providers in order to maximise their exposure and grab as much market share before other providers launch competing services.